The U.S. economy grew significantly faster than thought in the second quarter, which may help convince the Federal Reserve to start unwinding its stimulus program sooner rather than later. The nation's gross domestic product -- the broadest measure of economic activity -- rose at a 2.5% annual rate from April through June, according to a revised estimate from the Bureau of Economic Analysis Thursday. That's higher than the 1.7% rate originally reported, and better than the 2.1% rate that economists surveyed by Briefing.com were expecting. Rising exports, consumer spending and real estate spending helped boost the second quarter numbers. A decline in government spending acted as a drag. The big upward revision was primarily the result of a better trade balance -- the nation exported more and imported less than previously thought, according to Paul Ashworth, chief US Economist at Capital Economics. All economic news is being closely watched for signs on when the Federal Reserve will begin curtailing its controversial bond-buying program. The stronger economic growth emboldens views that the Fed could start pulling back as soon as next month. "The upward revision should give Fed officials more confidence that the recovery is gathering steam as the fiscal drag begins to fade," Ashworth wrote in a research note. "Under those circumstances, we still think the Fed will begin tapering its monthly asset purchases in September." The Fed has been buying $85 billion a month in Treasuries and mortgage-backed securities in an effort to keep interest rates low and spur economic growth. Last May, Fed Chairman Ben Bernanke outlined a plan to begin "tapering" the purchases, and pegged the timing of that plan to improving economic data. Investors have taken that to mean as early as September, and have sent bond yields -- and mortgage rates -- soaring. While 2.5% growth is decent, it's still below the 3.3% the economy has averaged since 1929. The August jobs report -- set for release next Friday -- will provide additional, and more current, data on the health of the U.S. economy. The government revises its GDP figures several times after the initial release. 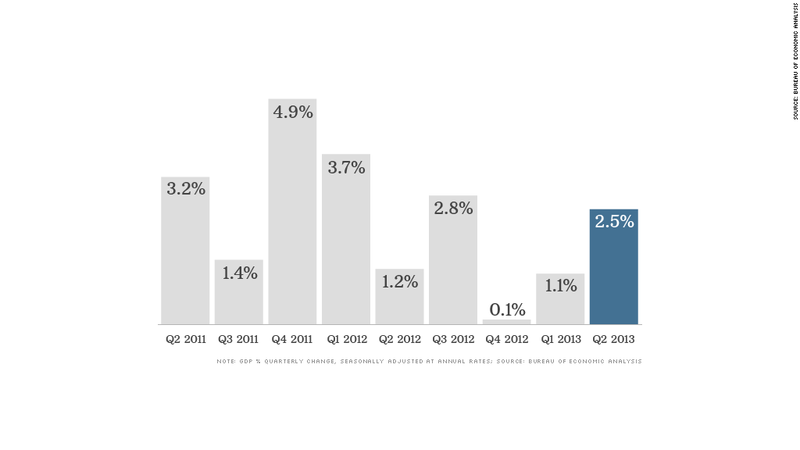 This is the second estimate for second quarter GDP.